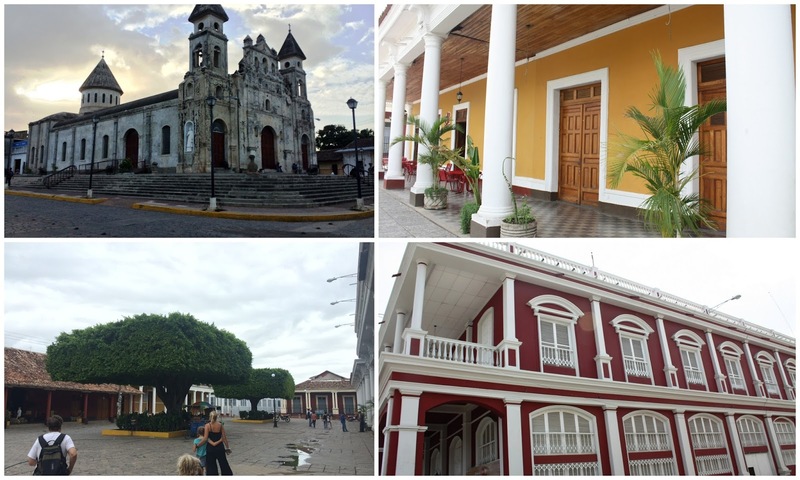 After leaving our Spanish school and homestay we were excited to get to the colonial city of Granada. 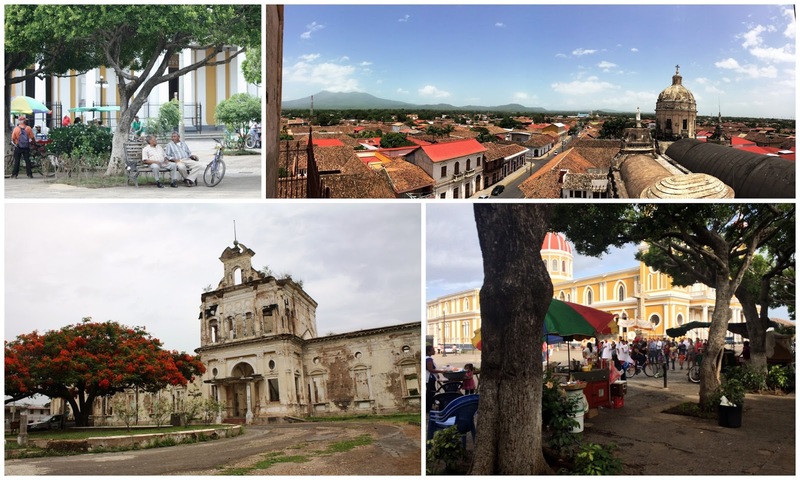 Granada is a major stop on the Latin America backpacker circuit and a popular stop for anyone visiting Nicaragua. 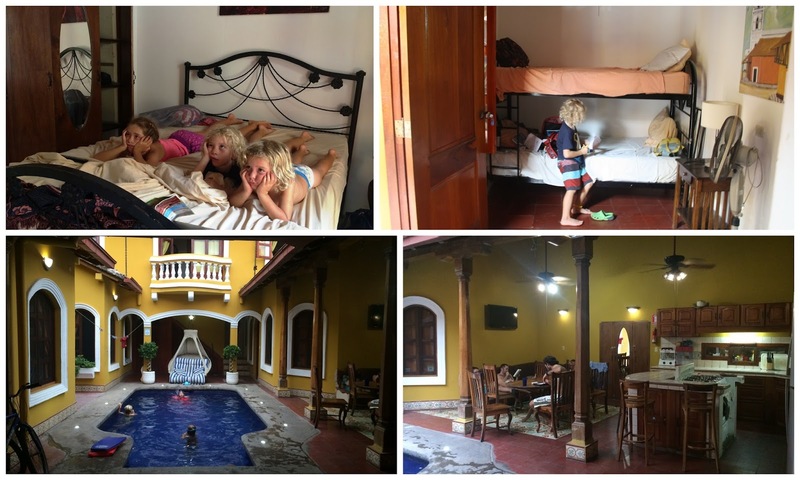 We found this great little guesthouse (Casa del Agua) that had a small courtyard pool, communal kitchen, free coffee and tea and cereal all day and a lovely family room in a historical building one block from the central square. No more brushing our teeth outside, no more awkward attempts at Spanish conversation with our host family, and no more beans and rice! 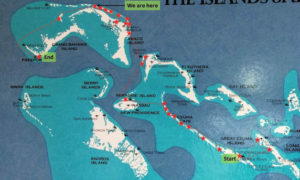 One of the things we appreciate so much from our time cruising was the wonderful people we met and backpacking is another avenue to meeting great people. 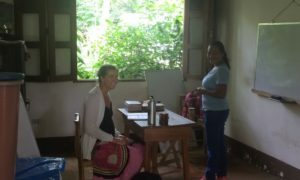 It has been great to meet other travelers at our guesthouse and share travel stories and tips. The kids never wanted to leave this guesthouse with the pool and the TV with English cartoons. 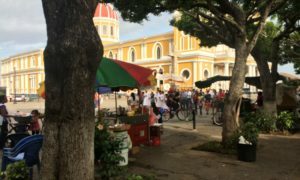 Since leaving the Spanish school, we are finding things more expensive in Nica than we expected and it has been difficult to stay on our $100/day budget. Food in particular can be really pricey if not eaten in a real local comida or at a food stall. 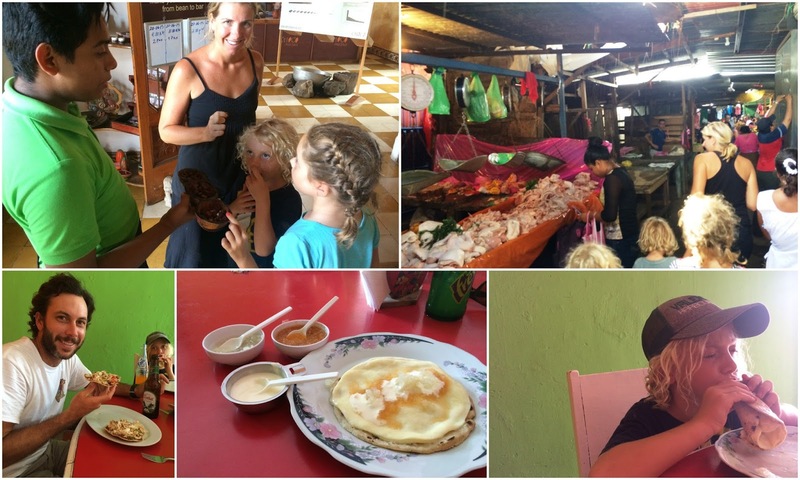 Unfortunately, the kids don’t particularly love the rice and beans and other Nica foods. With the communal kitchen at the guesthouse we were able to cook some of our own meals, which was a nice change. Grenada is an important city historically and we enjoyed learning all about the history of this city and country. We all enjoyed the horse and carriage ride we took around the city and our driver taught us a lot about all the sites and the city. Miles had developed a rash on his body and the driver told me that if we gave him a bath with some leaves from a special tree it would help. On our tour he found some of the special leaves and collected them for me. I proceeded to crush them up in a bucket of water and wash Miles down with them. There was no instant cure, but the rash faded after a couple of days. guides were fantastic helping the kids and we even tried special poses like Superman and upside down. 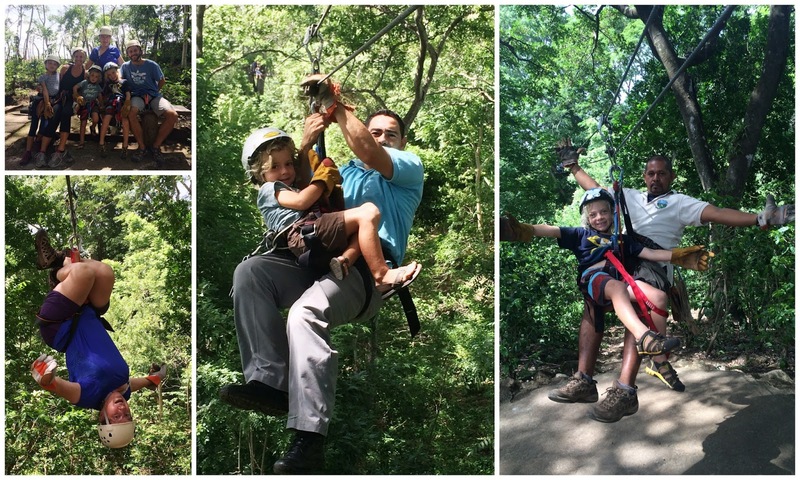 We were really impressed with how brave the kids were. Even my Aunt Patti put aside her fear of heights and came. We also saw a few howler monkeys in the mango trees. Mangoes are everywhere here and often just rot on the ground…so different from home where they are treasured! The mangoes taste so amazing here and we are loving all the fresh fruit, including the unusual for us, white pineapple and an Asian favourite, dragonfruit. 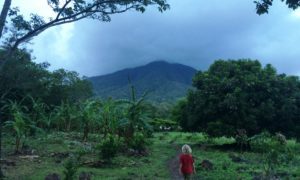 destination: the twin volcanic island of Ometepe. 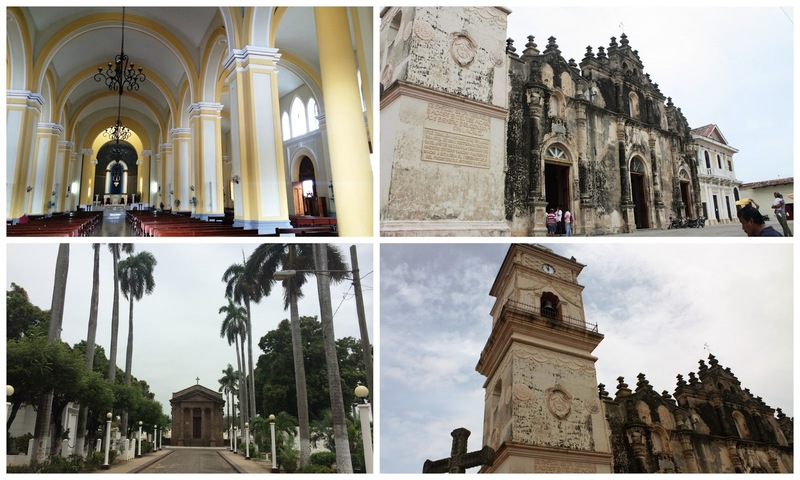 Iglesia de la Merced – they would not allow our kids to go up to the rooftop? 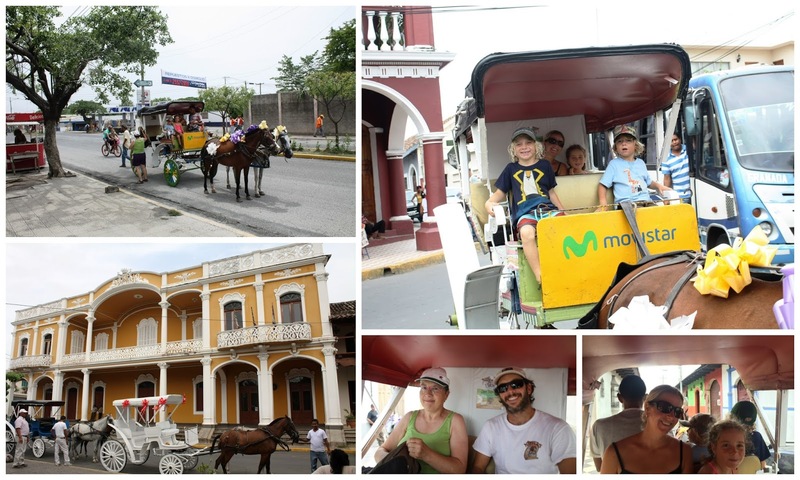 Carriage tour – really fun and we learned a lot about the city and its history. 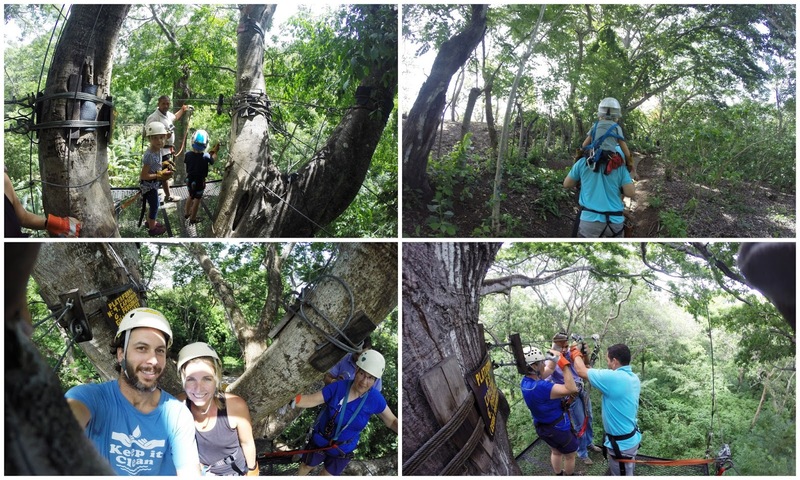 We paid 600C and went with Salvador (#78), who was a great guide. 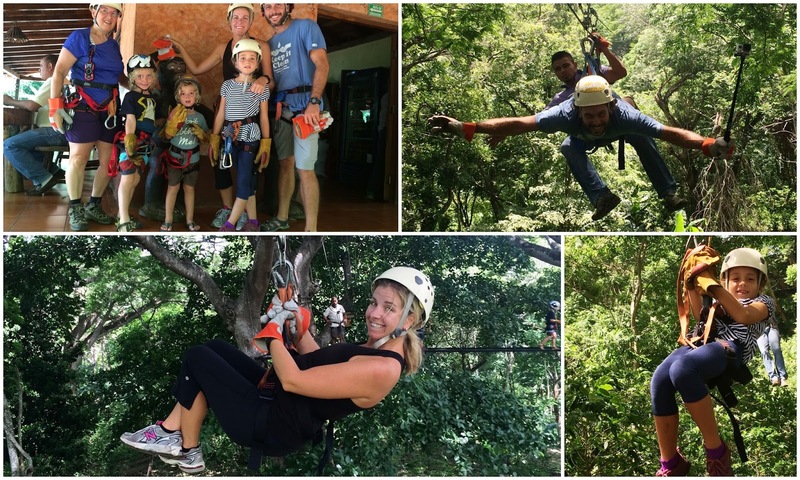 Ziplining – Miravalle Canopy Tour – we booked with one of the travel agencies on Calle la Calzada (included transport). 3825C for 5 of us. Great fun!